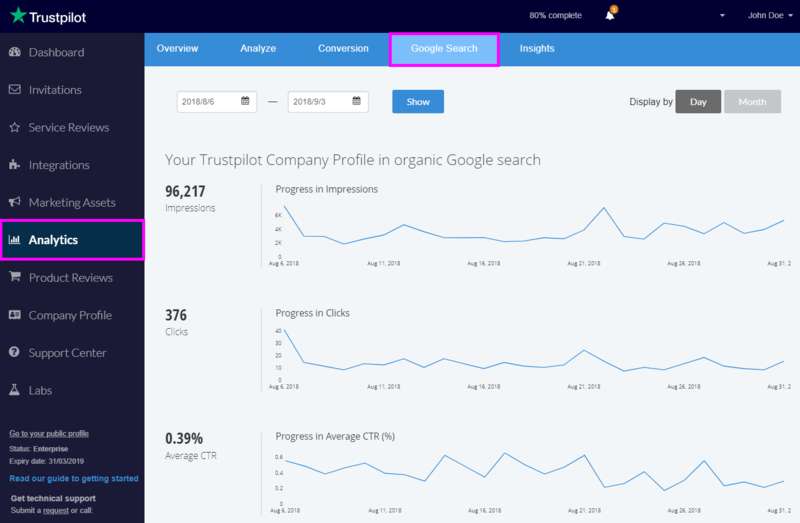 The Google Search dashboard displays overall data about Google searches such as: number of impressions of your Trustpilot company profile, number of clicks to your Trustpilot company profile, average CTR, and average position on search results. To access the Google Search feature, log in to your Business account and click on Analytics in the left side panel. At the top of the page, click on the Google Search tab. Impressions: This shows the number of times your Trustpilot company profile appeared in organic searches on Google. To explain how impressions work: a URL link such as https://www.trustpilot.com/review/[COMPANYNAME] records an impression when it appears in a search result. If the search result URL appears as a basic search result, like the example shown above, the URL records an impression even if the result is not scrolled into view. This is Google's standard impression rule. If the search result URL appears in a Google Carousel, the item must be scrolled into view in the Carousel to record an impression. If the search result URL appears in a Featured Snippet or Rich Card, the standard impression rule is applied. Clicks: The number of times your Trustpilot profile is clicked from Google search results pages. Average position: The average position is the average page ranking of your company in Google search results for a selected period. For example, when you search for your company or company reviews on Google, you can see the position of the company profile page with Trustpilot reviews and rating. Raw Data: This displays the data of total impressions, clicks, average CTR, and average position for a specific day. Where will my reviews be displayed? How do I use the Trustpilot Google Chrome extension?